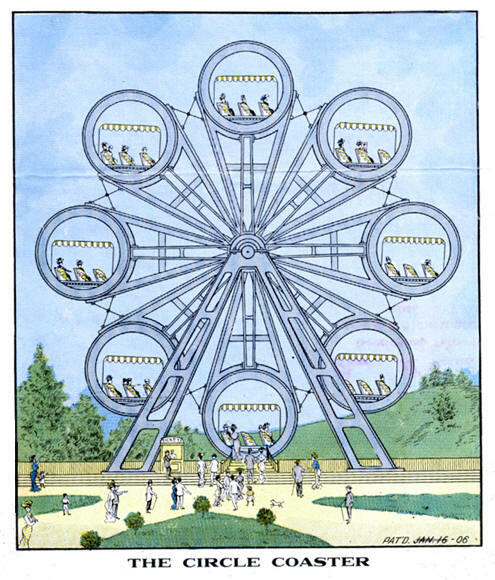 The wonderful new amusement device here pictured, namely: "The Circle Coaster," is the invention of a Philadelphian. It's novelty, beauty and practicability is evident at a glance. It's object is to provide amusement and diversion of a most fascinating nature, which will appeal alike to the old and young. In construction, it consists of two angular supporting towers, and from a central horizontal shaft rotates eight steel frame0work arms, holding in their giant grip eight circular com-partments. Within are arranged eight artistic coaches a smooth gliding motion. As the central shaft is ball-bearing, it requires a very small percentage of power to run it a small electric motor being sufficient. It's operating expense is small, it re quiring only three persons-a ticket seller and two operators. A brake band attachment is added to control it effectually when power is shut off. As each compartment is brought on a level with its lowest point of rotation, the passengers file in, and when all is ready for the trip the power is applied and the frame is rotated eight or ten times at a constant normal speed. The frame rotates backward from the starting point, while the cars of coaches move forward with a speed consistent with the pleasure of the passengers. As is evident in the picture, the coaches always remain at or near the centre of gravity, which is of course the bottom centre of compartments. THERE IS ABSOLUTELY NO DANGER; AS ALL PRECAUTIONS ARE TAKEN TO MAKE THE DEVICE SAFE STRONG. The passengers sit well back in the compartments, lover than in the picture securely and comfortable seated in the coaches. It has a quintuple motion - upward, downward, backward, forward, yet at the same time constantly onward. At night, with it's vari-colored electric illumination, it looks like a star-gazing dream of grandeur, and with the frames rotating and the coaches plunging onward in grace, harmony and uniformity, it presents a most spectacular sight. Therefore, aside from it's commercial value as an amusement device, it will be a good investment as an advertising feature in first class parks and resorts. It's strength, rigidity and perfect workmanship are a marvel of engineering skill, and it is built to support many times more weight than it can be subjected to. The coaches can be made to seat 10 people. Children will scream with delight with the pleasure and novelty of the ride, and the matured and old will exclaim: "how delightful. : It is in other words an observatory-or a revolving railway beauty and exhilarating satisfaction it is the "Acme: of pleasure, prompting the riders, like, Like "Oliver Twist," to ask for more. "Shall I go on-or have I said enough?" The picture shows more than words can express.